Diverse Executive Editor Dr. Jamal Watson moderates a panel on minority faculty recruitment and retention Thursday at the 104th annual meeting of the Association of American Colleges & Universities in Washington, D.C.
WASHINGTON— Centering around the theme “Can Higher Education Recapture the Elusive Dream?” institutional administrators and other education leaders gathered at the 104th annual meeting of the Association of American Colleges and Universities (AAC&U) to discuss higher education’s role in helping students achieve the “American dream” despite emerging discourse that the two are disconnected. Workshops and panel sessions largely offered best practices and strategies on areas including how to recruit and maintain diverse faculty members, how institutions can protect their brand and still support free speech on campus and how institutions can improve student success outcomes across two-and four-year institutions. At a keynote networking luncheon for faculty and administrators of color titled “When Core Values Collide: Diversity, Inclusion and Free Speech,” Hollins University president Dr. Pareena Lawrence talked about the challenges that ensue when institutions must uphold their core values of supporting freedom of speech while fostering diversity and inclusion. Lawrence cautioned that a “nerve is touched” on campuses when diverse groups of students feel that their voices are unheard or “not chosen.” She suggested that institutions can avoid or manage controversial demonstrations of expression by engaging with student groups beforehand to discuss how their speaker or event contributes to the academic dialogue. Institutions, she said, also can have codes of conduct that are inclusive for all students and a planned statement of principles that are clear and continuously updated. “Principles need to be lived every day,” she said, stressing the need for institutions to consistently apply their institutional policies around freedom of speech incidents on campus. At the panel session “Campus Freedom of Speech: The Need for Coordinated Efforts from Boards, Institutional Leaders and Faculty,” panelists expressed similar sentiments and expanded the conversation to address how offices within institutions can be unified on all fronts in their efforts to inform students and faculty about what the First Amendment exactly means. Institutions should articulate and model educational values, panelists said, by offering venues for students to participate in counter-programming and by allowing them to take ownership and lead discussions about various issues about which they feel strongly. “Perhaps a part of our job is to educate students about the First Amendment and Bill of Rights,” said Jeffrey B. Trammell, rector emeritus at College of William and Mary. This is sometimes because students learn about bullying throughout the K-12 pipeline and often assume speech they find offensive should be suppressed entirely, said James Madison University President Jonathan Alger, referencing a poll that showed that many college students did not believe in free speech the way it is interpreted in the courts. As more colleges accommodate their evolving student bodies, student support was tied to having diverse faculty that reflected the student body. 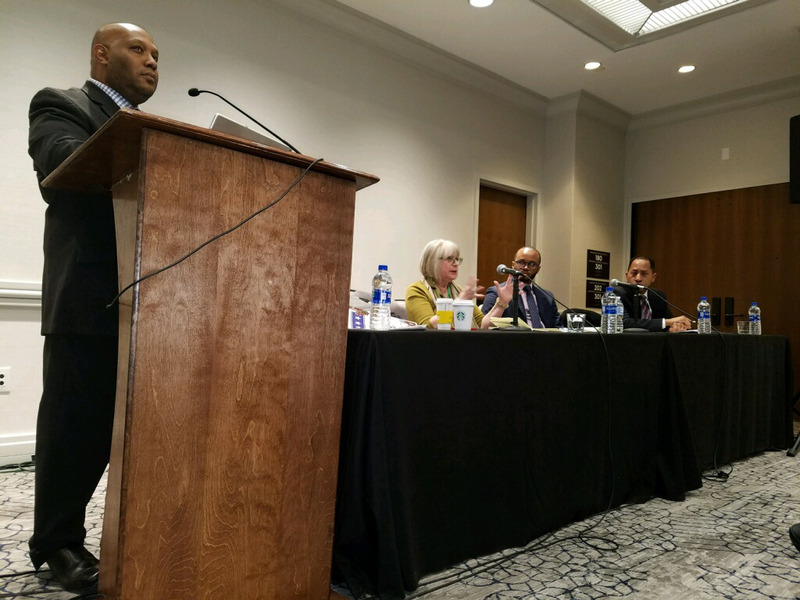 In a panel sponsored by Diverse titled, “Best Practices in Minority Faculty Recruitment and Retention, Part 1” panelists highlighted that institutions should be intentional in their efforts to recruit and maintain diverse faculty members. To grow the pool, institutions must first be intentional, honest and real about their objectives for having diversity, said civil rights attorney Amos Jones. However, he warned against outside counsel getting involved in the candidate-selection process because outside consultants may not know the unique culture of each institution. Additional suggestions for retaining faculty included creating “critical mass” and cutting down “silos” in academic disciplines for faculty members to have supportive networks among other diverse faculty, especially at institutions in rural areas. Gross said presidents and administrators should stop looking to minority faculty members “as if they are the only person on whom students can rely and to whom students should look to” regarding diversity issues.